The overarching mission of the rescue services comprises three main areas of responsibility: protection against disasters and accidents; crisis management; and civil defence. This mission covers a long chain of obligations in trying to improve societal prevention capabilities and manage threats, risks, accidents, and disasters concerning generic as well as individual safety. It follows a reactive social chain of threat-risk-crisis-crisis management-care-rehabilitation. 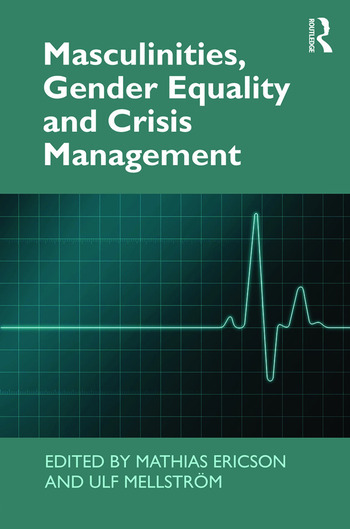 This book shows how the rescue services constitute a productive ground for contemporary gender studies, including feminist theory, masculinity and sexuality studies. Its critical perspective provides new directions for emergency work and crisis management in a broader sense, and in particular for scholars and practitioners in these areas. Contents: Introduction: masculinities, gender equality, crisis management and the rescue services: contested terrains and challenges, Ulf Mellström, Mathias Ericson, Anne-Charlott Callerstig, Katherine Harrison, Kristina Lindholm and Jennie Olofsson; Masculinity, sexualisation and the proactive turn in the firefighter profession, Mathias Ericson; Masculinity, emotions and ‘communities of relief’ among male emergency medical technicians, Morten Kyed; Masculinities and the dynamics of labour and power in the watch, Sarah O’Connor; Institutional patriarchy, auto-critique and resilience - a comparative gaze, Dave Baigent; Stray dogs and women are prohibited in the sentry on the spatial effects of fire fighters’ homosocial practices, Jennie Olofsson; Unpacking the black box of IDA: standardisation and disappearing gender, Katherine Harrison; Collaboration as a tool for implementing equality politics, Anne-Charlott Callerstig and Kristina Lindholm; Agents for change? Gender equality efforts in the Swedish rescue services, Ulrika Jansson; Index.